The I Like Scary Movies Experience is an immersive world of horror where visitors become both artists and subjects. 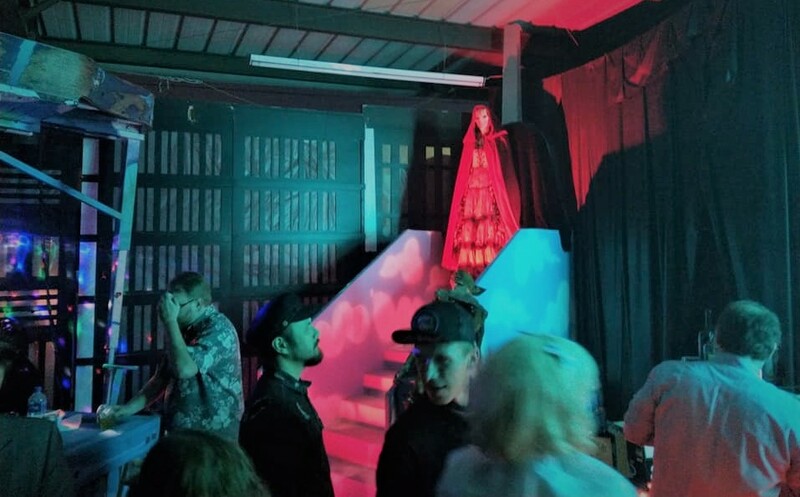 Conventional wisdom dictates that haunted attractions are not sustainable in Los Angeles except during Halloween, yet that doesn't stop ambitious impresarios from trying (as with 2017's Queen Mary Ghosts & Legends, which was essentially a haunted house tour relying on special effects rather than actors). 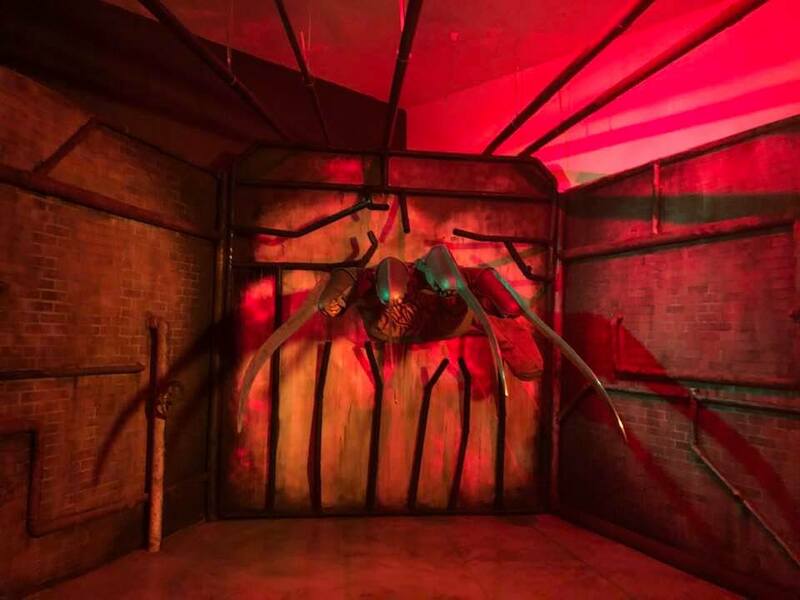 Probably the most effective attempt at an off-season horror event we have ever seen is the new I Like Scary Movies Experience, a series of installations immersing viewers in a cinematically inspired world of horror. The giant Freddy glove is impressive but strangely empty without a victim. More art gallery than Halloween haunt, I Like Scary Movies Experience offers an opportunity to peruse macabre exhibits with the enthusiasm of the demented connoisseurs in Dan Gilroy's Velvet Buzzsaw (though - so far, at least - with less fatal results). And since we live in an era when seeing with the eyes is secondary to photographing with smart phones, Maximillian (the "experiential artist" who masterminded the event) has cleverly contrived to turn selfie-addicts into both artists and subjects. Many exhibits feature an empty space that needs to be filled; the work is not complete until someone stands in place or sits in a chair to have a picture taken. Or to put it more prosaically, these artworks are arranged like a series of photo-ops, which invite not only poses but also participation, such as flinging oneself into a pit of foam blocks. Looking, it turns out, is only half the experience. As if to underscore that this is an upscale event, not just a little horror show, I Like Scary Movies is located inside the Desmond Building in the Miracle Mile district of Wilshire Boulevard, not far from the Los Angeles County Museum of Art. There is street parking on Wilshire for those lucky enough to find an empty space; otherwise, you have to shell out for a spot in a nearby parking lot. Side streets are tempting ticket-traps - with resident-only parking after 6pm. Fortunately, this is the kind of area where walking a block or two affords an opportunity to find a great place to eat after attending the show. Suspiria (1977) is not one of the official inspirations for I Like Scary Movies, but this corridor is reminiscent. The event’s logo, rendered life-sized, affords one of many photo opportunities. The building itself is venerable enough to engender an aura of respect but old enough to project a slightly creepy atmosphere when dimly lit. More important, it offers vast amounts of space for the exhibits, with large showrooms separated by long corridors that, with the help of a few color gels, would not look out-of-place in an actual horror movie. Upon entering the main exhibition area, the first impression is one of magnitude. I Like Scary Movies is nothing if not immense, immediately dwarfing any concerns about the $39 ticket price. Each exhibition area is practically worth admission on its own, and there are five, based on horror movies owned by Warner Bros. Studios: The Shining, IT, A Nightmare on Elm Street, Beetlejuice, and The Lost Boys. 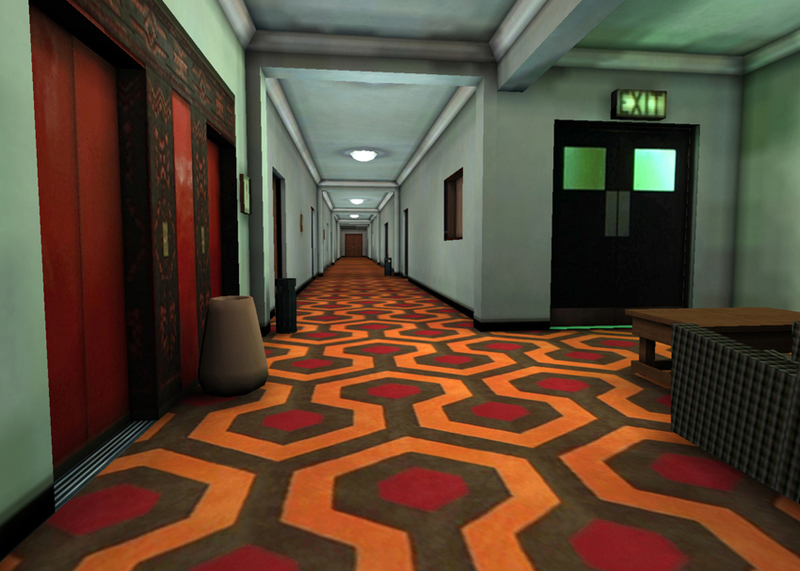 First in line is The Shining, with visual inspired by Stanley Kubrick's 1980 feature film (not the made-for-TV remake). On display is not an exact reproduction of the Overlook Hotel but some interesting variations that combine and re-imagine famous visual motifs to great effect, such as the hedge maze trimmed to spell "Redrum." What kind of shoddy joint is this? Shattered doorways float above the Gold Room. …make Jack a dull boy. The Shining exhibit occupies four rooms: one for the hedge maze, one for the elevator of blood, one with the window through which Wendy (Shelley Duvall) escapes in the film, and one more or less representing the Gold Room, with walls and floor carpeted in the distinctive pattern seen in the movie. Don't let the rattling lock scare you away from looking through the cracks in the door to the infamous Room 237, for a little surprise. Here more than anywhere else, I Like Scary movies achieves the illusion of immersing visitors inside a horror movie. The effect makes the Shining maze from the 2017 Halloween Horror Nights at Universal Studios Hollywood look puny by comparison. The 2017 film version of Stephen King's IT provides an opportunity for some demented fun house stylings. As with the Shining exhibit, the scale of what's on view is extremely impressive, ranging from a mountain of discarded toys and balloons to what must be thousands of paper boats, with Pennywise lurking here and there, though never fully revealing himself in human form. This exhibit features one of the less obvious photo ops: by entering the mountain of toys, you can position yourself inside Pennywise's gaping maw so that your face is visible to those staring down his throat. Unlike the first two exhibits, the scenes from A Nightmare on Elm Street are not presented in large show rooms but in smaller spaces set off of a long corridor. There is an over-sized version of Freddy Kruger's signature glove - with movable fingers so that you can better position those razor-sharp knifes, a macabre throne, and hedge formed into Freddy's hand, reaching out for a woman obliviously taking a selfie. The latter exhibit seems like a piece of self-reflexive satire, depicting what visitors to I Like Scary Movies are doing. This will be her last selfie! The Freddy exhibits are great, but they receive less space than those of the other franchises on display. Considering the wealth of dream imagery in the Nightmare on Elm Street films, we wish the opportunity for surrealism had been explored a little more. More comedy than horror, Beetlejuice would seem to be the odd-man-out in the I Like Scary Movies Experience, but Maximillian seizes on the film's many memorable visuals to create life-size versions as macabre as anything seen in the rest of the exhibition. In fact, this exhibit features more memorable photo ops than any other. 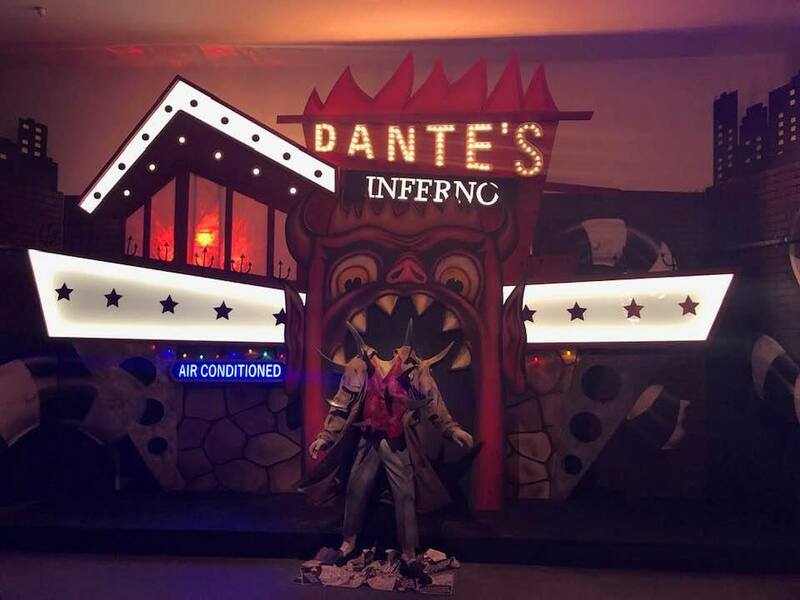 At this point the only thing more we could have wished for would have been for Dante's Inferno to be open for business. Volunteers can jump in the pit of foam blocks in the background. And people say I have a big head! Last and least among the I Like Scary Movies exhibits is The Lost Boys, only because less space is devoted to the 1987 vampire film; there are only two rooms. The first contains the gang's lair in the caves of Santa Clara and the overhead train tracks from which the vampires dangled. Both settings are wonderfully rendered, and the trestle bridge allows visitors to recreate the scene from the film. The second room features a giant box of takeout noodles, which is just weird enough to be interesting but not the best expression of the film's vampire theme. The far wall offers merchandise for sale, indicating the end of the I Like Scary Movies Experience has been reached. I Like Scary Movies is much more a gallery of weird exhibits; it truly is an immersive experience, inviting viewers to become part of the scene. There are so many amazing detailed exhibits on view that a visit will last at least an hour, possibly more if crowds are thick. It may go without saying, but bring smart phones, iPads, digital cameras, and/or camcorders, because the point of I Like Scary Movies is not merely to see but to be seen - and not only seen but photographed for the rest of the world to see. Fans attending should be ready for their closeups, because I Like Scary Movies turns you into the star of the show. Be ready for your closeup, because the display looks empty without you. Magnificent and immense, this macabre gallery immerses visitors in an amazingly detailed series of horror-movie-inspired exhibits. I Like Scary Movies is scheduled to run through June 16. The Desmond Building is located at 5514 Wilshire Boulevard in Los Angeles. Tickets are $39, sold in 15-minute intervals. The experience lasts 60-90 minutes depending on the pace you set. Get more info here: ilikescarymoviesexperience.com.